Bacan is a group of islands in the Maluku Islands and becomes the largest island on the territory. The islands are mountainous and forested. The islands lie in south of Ternate and west of Halmahera’s southernmost arm. Bacan itself is the largest; while, the second and third largest islands are Kasiruta and Mandioli. The rest are about dozens of smaller islands in the group. 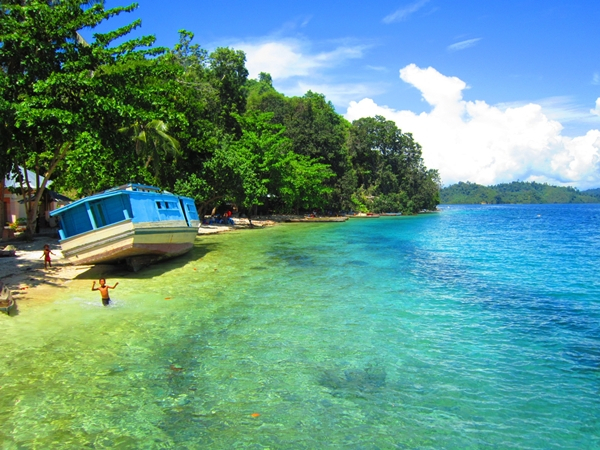 Bacan Island is part of North Maluku province, precisely located in the Bacan sub-district. Bacan is an island that inhabited by any of the Quadrumana, a black ape occurring here as in the Moluccas. The island is very rich in birds and insects. Bacan (along with Halmahera)is home for the world’s largest bee, the giant mason bee, Chalicodoma pluto. Geographically, The island is an irregular form, consisting of two distinct mountainous parts, united by a low isthmus, which a slight subsidence would submerge. The island is in part of volcanic formation, and the existence of hot springs points to volcanic activity. However, coal and other minerals have been discovered in this island. A large portion of the island is richly wooded, and sago, coconuts and cloves are abundantly produced. The hinterland of the island is relatively uninhabited and none of the coast-dwellers are indigenous. They consist of the Sirani (Christian descendants of the Portuguese), of Malays, Papuans, and immigrants from other islands. The total number of inhabitants is about 13,000. The most significant town on the island is the Bacan sub-district capital Labuha, which situated on the west side of the island. Nearby is the town of Amasing (or Amasingkota), once a significant settlement on the island. Several Austronesian and non-Austronesian languages are spoken on Bacan, including Tobelo, Galela, Ternate, Bajau, and Tukang Besi. However, the indigenous language of Bacan is Bacanese, also known as Bacan Malay.